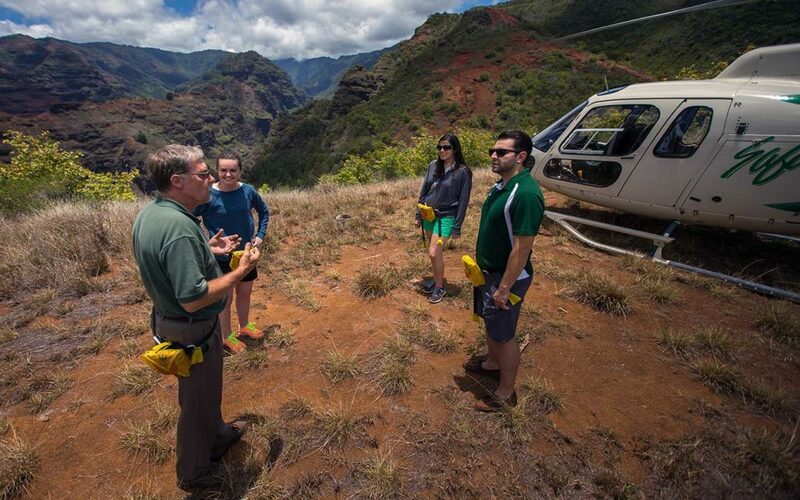 The Best Helicopter Tours in Kauai: We Rate our Favorites! The Top helicopter Tours of Kauai! Of all the Hawaiian islands, Kauai demands a helicopter more than any other. From the vast Waimea Canyon (the ‘Grand Canyon of the Pacific’) to the Na Pali coast, the terrain is not easy to reach from the ground. If you haven’t taken a helicopter tours in a number of years, then you may be surprised at how comfortable and quiet the experience can be. Newer helicopters have quieter blades and executive seats with a lot more room than older seats. You can also see so much more than you used to, thanks to more expansive glass-areas that enable you to take in the view all around you. There’s also a number of factors you need to consider when you book your trip. Do you want to do a morning tour? What about an afternoon tour? And how long do you want to be up there? Tours range from 35 minutes to over 2 hours. Do you want to take off from Princeville? Lihue? Different companies take off from different locations as well. We did the research to find out all these offerings from the major helicopter tour companies currently operating out of Kauai. Are You Not in Kauai? What if you’re not staying in Kauai? If you’re staying on Oahu (Honolulu) and want to do a helicopter tour, there are packages available that will fly you over and back in time to get back to your hotel! Oh, and just because we are recommending these companies, it doesn’t mean that we want you to give them all your money. Please use as many promo codes and coupon offers that you can so that they make as little profit as possible. For example we found a valid hotel promo code for one of the nicest properties on Kauai. 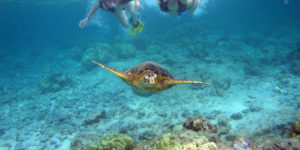 Blue Hawaiian offers both eco-tours and private charters for custom experiences. Their chopper is the new Airbus Eco-Star, which has a 50% reduction in noise. You can also talk to the pilots, who are certified Hawaii tour guides. The helicopter leaves from Lihue, and takes you to Hanapepe Valley. Then, they take you over Mana Waiapuna, which most people refer to as ‘Jurassic Park Falls’ (they were in the first movie!). 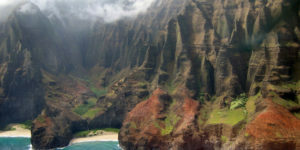 Then you’ll be taken to two canyons (this island has such diverse terrain): Olokele Canyon, and then Waimea Canyon. Waimea canyon is famous for its red dirt, which you can appreciate from high up and not have permanently-stained socks and shoes from walking in it. Then the tour will take you along the Na Pali Coast, with slopes that pour rain water into the ocean and create a distinct turquoise color. See if you can spot the large sea turtles in the water and the monk seals on the beaches here. The treacherous landscape means that very few people can reach this area. Then they’ll wrap up the island tour by taking you to see Hanalei Bay and the Princeville resort area. To finish off the grand tour, weather permitting that is, they’ll take you to Mt. Waialeale, which is known as the wettest place on Earth! The helicopter will fly into the center of the crater, with 5000 foot walls surrounding you. There’s also 3000 foot waterfalls surrounding you when you’re down there! The whole tour is approximately 50 minutes. The cost of the tour includes taxes and fees, but the tour operators will make a video of the tour and put it on a DVD that you can purchase at an additional cost. Children under 24 months can come along for free. FAA regulations require Individuals who weigh over 250 pounds to purchase an additional seat. One will be offered for a 50% discount. All passengers will be weighted prior to takeoff (as part of FAA regulations). No scuba diving for 24 hours before your tour’s scheduled takeoff. When you book, you can opt for either a morning or afternoon tour. Once you select your preferred date and time of tour, you’ll be contacted by Blue Hawaiian with all the details you’ll need. A-Star has two advantages over Blue Hawaiian: you can choose either a 60-minute or a 90-minute tour, the latter of which makes it the longest helicopter tour available. The second is really cool: they’ve been permitted by the FAA to fly at the lowest altitudes available in Kauai. That means you’re going to get real close and personal with your surroundings! Why did we rank it second then? Don’t get us wrong: these are both amazing experiences with amazing tour guides and breathtaking scenery. We ranked it 2nd place because the helicopter is the Hughes 500s, which are a little louder than the Airbus Eco-Star. A-Star flies with the doors off, however, so you’re going to get even closer to the scenery! The locations that you visit on this tour are also more numerous due to the longer trip. On the 90 minute trip you’ll also visit Nawiliwili Harbor, Tunnel of Trees, Kipu Kai, and theMenehune Fishpond. You’ll also spend a little more time at each location, so you can get the perfect picture. Jack Harter (and all helicopter tours) have the same weight restrictions, which are due to FAA regulations. Everyone will be weighed when they arrive for the tour. They have a standard 24-hour cancellation policy. Safari Helicopters has one great advantage over the other two tours: they include a mid-tour landing! When you go on their 90 minute tour, they will land in the Kauai Wildlife Refuge. This overlooks the Olokele Canyon, so you’ll have some amazing pictures to take home with you. This area has no roads, and is off-limits to the public. Safari Helicopters is the only company permitted to land there. After touching down in the Refuge, you’ll be able to explore the area for approximately 40 minutes. The Refuge belongs to the Robinson family, and on rare occasions, he might stop by to talk with you about preservation of the natural beauty of the islands. If you don’t want to touchdown, there is the Deluxe Waterfall Safari, which is the exact same tour, but they skip the landing. It lasts approximately 60 minutes, and costs quite a bit less (their pricing changes quite a bit, so we don’t want to be inaccurate by posting their prices). Safari Helicopters takes off from Lihue as well. Tours leave at 4:30PM. Drinks provided on the tour. They have the same weight limits. Although you’ll need to purchase a second seat at full price (as opposed to 50% off like Blue Hawaiian). 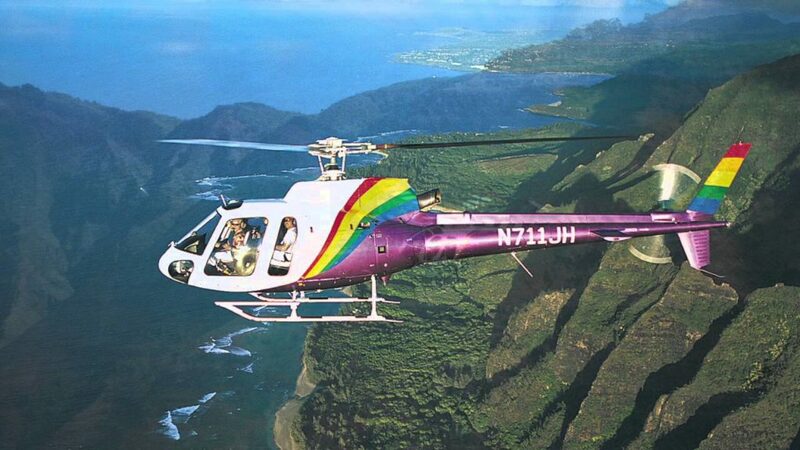 If you’re staying in Honolulu, you can still get an amazing helicopter tour of Kauai and be home in time for dinner! Here’s how it works: the tour will pick you up from your Waikiki hotel at 5:00am, where you’ll take a short flight to Kauai. Then, you’ll go on a land tour where you’ll see Opaeka’a Falls,Kalalea Mountain, Kealia Scenic Viewpoint, Princeville and Kapa’a. For lunch you’ll dine at the famous Tahiti Nui restaurant, and then its off to Hanalei. 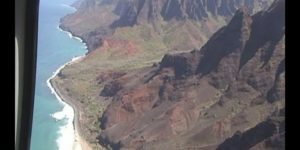 At 3:30pm you’ll begin your 50-55 minute helicopter tour, where you’ll visit the greatest spots on Kauai: Na pali coast, Waimean canyon, all the same sites you’d see in the top 3 tours listed above. Right after the helicopter lands, you’ll be taken back to the airport for a flight back to Oahu, where you’ll arrive back to your Waikiki hotel around approximately 7-7:30pm. What a day that’ll be! Aloha, and Mahalo once again.